[By Nick] Hopefully you made it through my long post about Day 1 of my Ben & Jerry's post because Day 2 will be just as long or longer. Get yourself some ice cream and relax. Day 2 started a lot earlier than Day 1 did. Thankfully I had no travel problems to deal with this time around. After getting plenty of fruit in me for breakfast, it was time to head to one of the farms in which Ben & Jerry's gets their milk from. Or at least try seeing it because we got lost a few times and at one point my phone welcomed me to Canada. Seeing as I come from Upstate, NY, cows or farms aren't that much of a novelty to me. I may or may have not mooed at multiple cows while we were here. I probably knew some of their relatives back home. 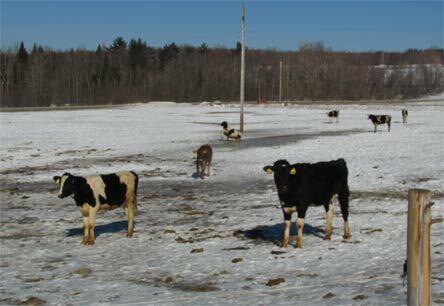 Ben & Jerry's brought us out here to explain their caring dairy program which was started after Dubba went on his trip. Just like the social part of the company, I would do nothing but injustice explaining it. You can find a link to the info on the program here. What I gained from things is happy cows make for better milk and something about them getting water beds to sleep on. I might have made that last part up, I'm not 100% sure though. That or some memory foam mattresses. After our trip to Canada... I mean the farm, it was time to head to Waterbury where Ben & Jerry's factory is located. This was an hour drive so I took full advantage of taking a nap because once again, I am a child. 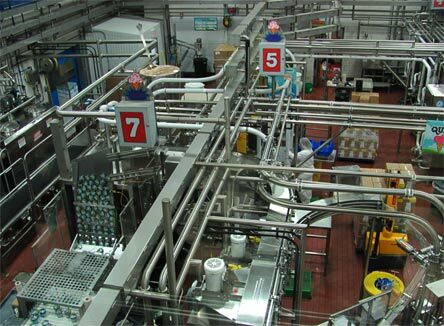 Once we walked into the factory, you're hit by a smell of waffle cones. That fact Ben & Jerry's doesn't bottle this smell up and sell it as perfume is beyond me. I think I'd give any girl the time of day if she was wearing that. Heck, I'd even hang out with Dubba if he had it on. In the front, there's a gift shop where you can buy all kinds of Ben & Jerry's novelties as well as shirts that are available at most scoop shops. Since we were a bit early for our tour, we had lunch. During lunch we were able to try a flavor straight of the line. Wouldn't you know, they were producing Coffee Toffee Bar Crunch today. I'm not a fan of coincidences and I wouldn't doubt they've read all your comments on both of my toffee bar reviews. Well what's the verdict? Fresh Ben & Jerry's is good but I'm more of a fan of fresh made gelato. It's a little too soft serve like for me and I'd rather have it harder like ice cream should be. As for the flavor, well it wasn't the horrible stuff I reviewed when they first made the change. The coffee base is back to its normal delicious self and the toffee isn't burnt at all. While I still think the Heath version is better, this isn't a bad substitute. I just wonder how it'll hold up and react when completely frozen. Only time will tell when I can make sure I have the newer batches to review and from the comments we still get, those bad batches are still out there. Next it was time to take our tour of the factory. This tour is the same tour anyone can take when they visit the factory. Warning: it's filled with puns. I'm a fan of puns so it was right up my alley. Other warning, I know way too much about Ben & Jerry's history that I knew everything that was said on the tour. If you were wondering how cores are made, well they aren't at this factory either and all that stuff is top secret that we weren't even told exactly how it works. All I was looking forward to was the tour exclusive flavor that you get at the end of it so I could add it to my list of flavors tried. 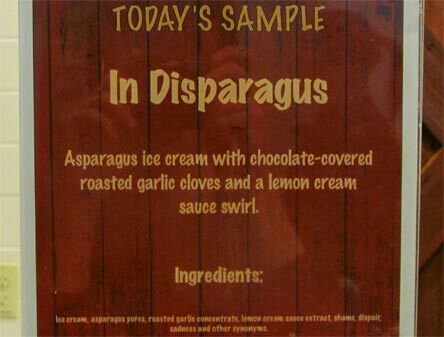 In Ben & Jerry's fashion, they had a joke flavor displayed to try and throw people off. To be honest, I would have loved to try it. However, we got a flavor that looked and sounded very familiar to me. Yep, Brownie Chewgooder had been reincarnated. This time with a standard vanilla base but still a delicious combo. Next to Oreos, brownies are my second favorite mix-in and I might have had two or three of the samples. Most of us ended up hitting up the scoop shop for more flavors. 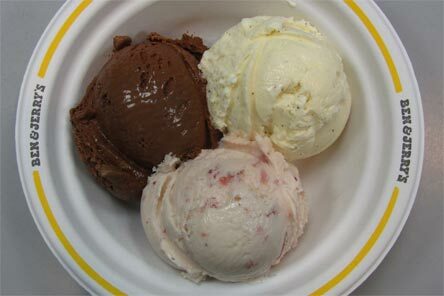 Seeing as it was on Ben & Jerry's and I know none of you would want a full review of their vanilla, chocolate and strawberry ice creams, I had to grab all three. First off, Ben & Jerry's makes some good bases. The vanilla is light, clean and perfect for mix-ins. I know I complain about their chocolate (and got other important people in the company to agree it's too dominate) but as a standalone flavor, it's really good. It's very dark and fudge like. Without anything to overpower, it's actually nice to savour on its own. I gained a new appreciation for it as an ice cream flavor but not as one when mix-ins are involved. The strawberry was just okay. It's not a very strong flavor but at least it tastes natural. I can see why none of their current pint line up uses it as a base though. With all three mixed, it makes a quality neopalitan. 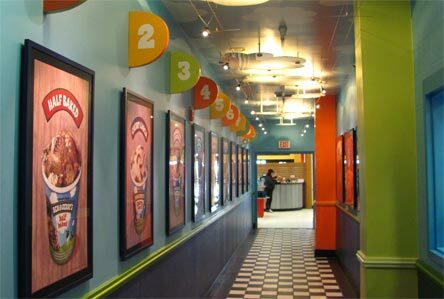 After that, I wandered down the hall where they list their Top 10 flavors. As most of you know, Half Baked claimed the top spot over the long reigning Cherry Garcia not too long ago. The Top 10 is filled with your usual suspects, most of which wouldn't even make Top 10. Cinnamon Buns needs more love people. For those wondering, the Top 10 from 1-10 is Half Baked, Cherry Garcia, Chocolate Chip Cookie Dough, Chocolate Fudge Brownie, Phish Food, Strawberry Cheesecake, Coffee Toffee Bar Crunch, Chunky Monkey, Peanut Butter Cup and Americone Dream. At least that's what my memory says and that same memory thinks cows sleep on water beds. Now it was time to sign my life away and do what every Upstate New Yorker wants to do, walk on snow! Oh wait, I do that enough already. However we did have people in the group from warmer states who don't get to experience snow or have the chance to go snow shoeing. I'll admit, I liked it more than I expected. Not enough to buy my own pair but it was a worthy experience. 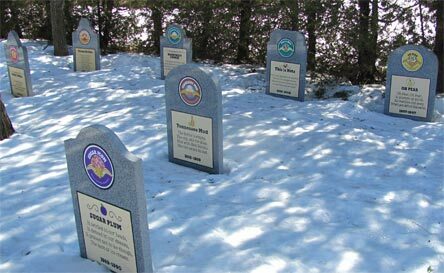 At the end of the snow shoeing trek, we found ourselves at the flavor graveyard. Thankfully I didn't see a tombstone with my name on it so things were looking good. Checking out all the residents of the graveyard, all I have to say is they need to update things. I know I'm 22 but 1/3rd of the flavors were killed off before I was born and the rest I was never really contious enough about Ben & Jerry's to try. Well except for one: Creme Brulee. I actually reviewed this one the year that it got sent to its demise. While we didn't see tastebud to tastebud, I payed my respects and it was time to call it a day and head back to the hotel to get ready for dinner. Oh, Sap. I knew those Bourban Babes were our toughest competition and I had no problem losing to them. Especially when Eric noted that our flavor was voted for by both flavor gurus. While that pint club membership would've been cool, I'll take getting the thumbs up from the guys who create all of the flavors any day of the week. That would be the end of the trip but I had the privileged to sit across from Eric at dinner so of course I had to pick his mind. I was able to find out a bunch of stuff but most importantly why some of the more popular flavors have been killed off. First off, the hyped Oatmeal Cookie Chunk. This was a big hit for people and the reason is quite simple, the bakery that supplied the oatmeal cookies stopped producing them. While Eric and the team went to multiple bakeries to get them to replicate the mix-in, none of them were up to par. 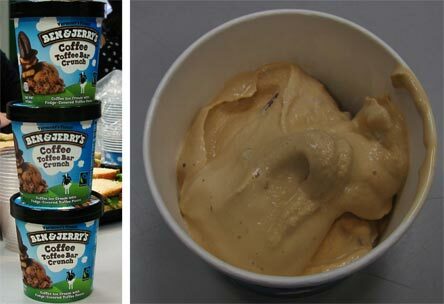 So instead of putting out a lesser quality ice cream, they had no choice but to send it to the graveyard. Next, Dublin Mudslide. We still get questions about this one and the problem here was they couldn't get any fair-trade/non-gmo Irish cream. Most shockingly of the bunch was Late Night Snack. The reason behind this one was because Jimmy would no longer be on the show, the network didn't want him a part of anything that dealt with the show. While some of you know, this flavor was released in other countries as Couch Potato. While there's no plans of it being re-released in the US as such, I wouldn't put it past them. There are probably more I'm forgetting but at that point, I was beyond spent. Oh wait one more! Coconut Seven Layer Bar is a beloved scoop shop exclusive and for those of you hoping to see it in pints, don't hold your breath. 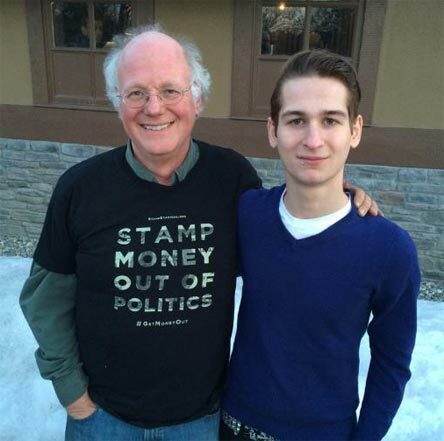 The ingredients are too costly that Ben & Jerry's wouldn't make much of a profit at their current price point and would have to increase the price to compensate for things. 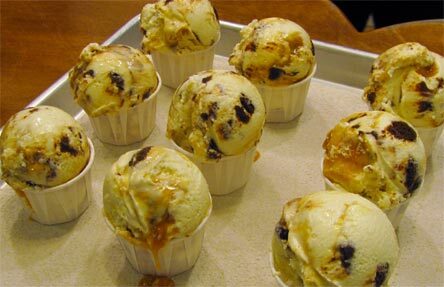 So head to your local scoop shop to get your fix, I know I still need to try it as well. With everything done, it was time to say our good-byes, head back to the hotel and get some rest before heading back to good old Albany. I'd just like to thank everyone from Ben & Jerry's who made this trip perfect. It's certainly a memory that I'll never forget. I'd also like to thank all of the other insiders who put up with me and I hope our paths cross again sometime soon. Well there you have it, two days of pure bliss courtesy of Ben & Jerry's. If you have any questions, don't hesitate to ask. I'm sure there's plenty of stuff I didn't mention or address in these posts. On that note, thanks for reading! I think I know how the cores are made. There is a machine that pumps out 3 compartments at once. The two tubes are filled with ice cream and the middle tube is filled with core. Pumped out at the same time. Kaitlyn, I ate far more ice cream on my trip to The Gelato Fiasco aha. I'm a well seasoned vet. Nice to see a picture of you Nick; you are very handsome! Thank you for asking about Oatmeal Chunk Cookie. It's the only thing I would have asked so appreciate that you thought of it! It was my fav and I'm still grieving it's demise. Sad that they couldn't find another company to replicate an ingredient. This might seem stupid but I thought Ben and Jerry sold the company to Unilever so was surprised to see they are still involved. Great write up Nick; enjoyed it very much. 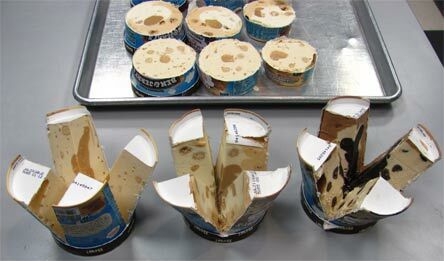 Heads up to anyone with Blue Bell in your freezer. The company has shut down their Oklahoma facility due to continued listeria concerns. Check to make sure you don't have any affected product! A very happy Easter to Nick, Dubba and family! I new that was a major loss for people so I made sure to leave Vermont with the details for its demise. They did sell the company to Unilever and they aren't really officially involved in the company. They do however still show up for events and such since they were such an important part of the company. That and Ben & Jerry's has a separate board so they can keep the Ben & Jerry's social mission in tact. Anon #2,thank you for the kind words, the heads up about blue bell and you have a great Easter yourself! @Dubba, I will fight you, sir. I know where you live. You can't hide for long. It's getting harder & harder to find Cinnamon Buns. That's the only ice cream/gelato I usually have to eat it all in one sitting. OATMEALLLL COOKIEEE CHUNKKKK!!! I am mortified and horrified by the dismissive glib mention of this national treasure. FIND ANOTHER SUPPLIER! For Gods sakes. I have pretty much stopped buying B and Js after the Oatmeal Cookie Chunk fiasco :-( Love is too weak a word.